On the bench, one would never guess the amount of power that sits, restrained. But when he is unleashed in the midfield, it may as well be a nuclear meltdown, because his energy level is well above radioactive levels. He is tenacious, determined, and quite fast, troubling the opponent like no one else. And if you give him even the slightest look at goal, whether it be at close range or from distance, he is also going to trouble your keeper. 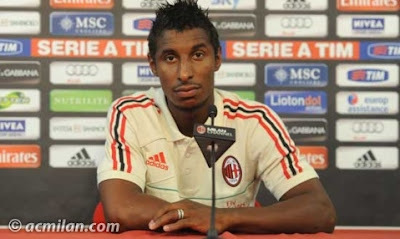 I speak, of course, of Kevin Constant, midfield reactor. The 25 year-old French born Guinean national spent his youth career and the first four years of his senior career in France. Beginning in Toulouse, he made four appearances for the senior team in two years’ time. Then he went to Ligue 2 side Chateauroux, where in two years’ time, he scored 15 goals in 79 appearances. 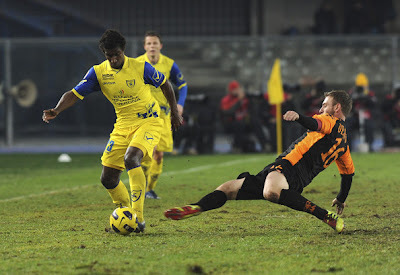 Then his fortunes changed as he was loaned out to Chievo in Serie A in 2010. He made 32 appearances and scored 2 goals for the Italian side, at which point they opted to purchase him. They immediately then sold him to Genoa, where he struggled to be quite the same player. Last season, he scored only 1 goal in 21 appearances for Genoa. Muntari’s poor luck was Constant’s good fortune, as Milan needed a replacement for the former when he tore his ACL and was going to be out six months. So, while Galliani was making the Acerbi deal happen, he got Preziosi to throw in Constant on a one year loan deal, too. Welcome to Milan, Constant. His celebration at Genoa, let's hope we get to see a few of those in red and black! While at Milan, he has chosen to wear the number 21, last worn by Andrea Pirlo. I don’t think he is looking for anyone to make comparisons, but rather, I’m guessing that he is not daunted by anyone and is prepared to make the number his own. Certainly, that is how his personality seems, he is not intimidated, but rather calm and confident. He played for France in their U-17 side, racking up a whopping 3 appearances and one goal for them. But when he was ready to be called up to a senior team, he chose Guinea, his mother’s country of birth. Since 2012, he has made 12 appearances for the Guinea national team and scored 2 goals. His stats are not particularly amazing, and without a lot of information about him, it is hard to tell what this guy is made of. But as soon as he takes the pitch, it is easy to see. He is like an explosion of energy, a force to be reckoned with, and an immediate threat to the opposition. He may have had a less than impressive year at Genoa, but if his preseason performances are to be believed, he is going to fill the Milan jersey with pride. 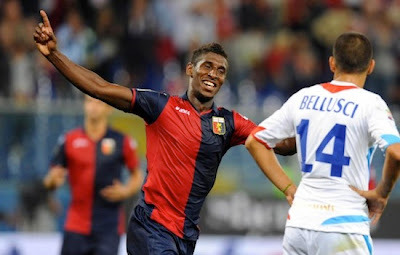 Welcome to Milan, Kévin Constant. May your playing time be great and your injuries be non-existent!